Here is a followup on the pattern evolution this week. 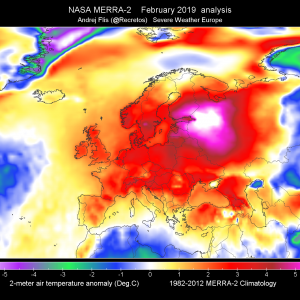 A strong upper ridge remains in place across N-NE Europe and NW Russia, resulting in abnormally high temperatures over the region. Locally up to +34 °C daytime peak temperatures are observed – many stations have broken all time record values! 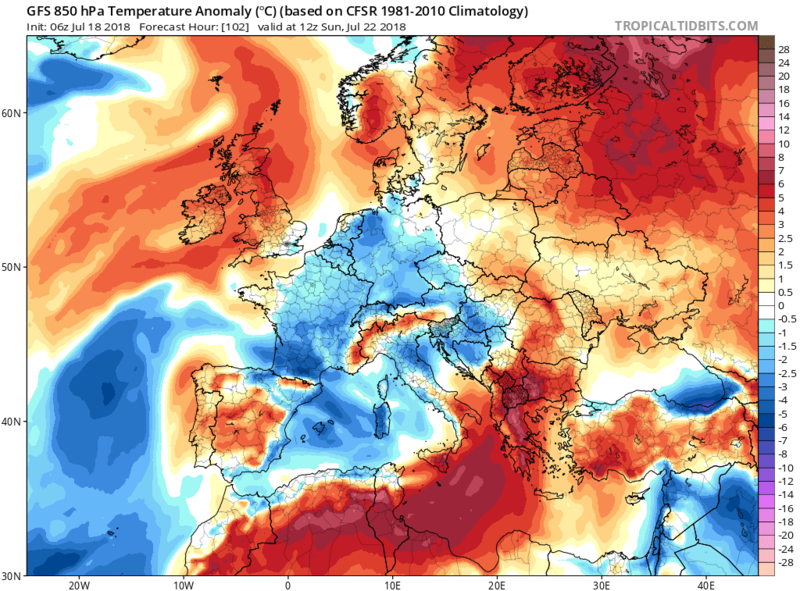 A subtropical ridge remains in place also across N Africa and S Mediterranean (Algeria continues experiencing daily maximum temperatures up to nearly +50 °C). A large upper low with lots of convective activity is placed across SE Europe. 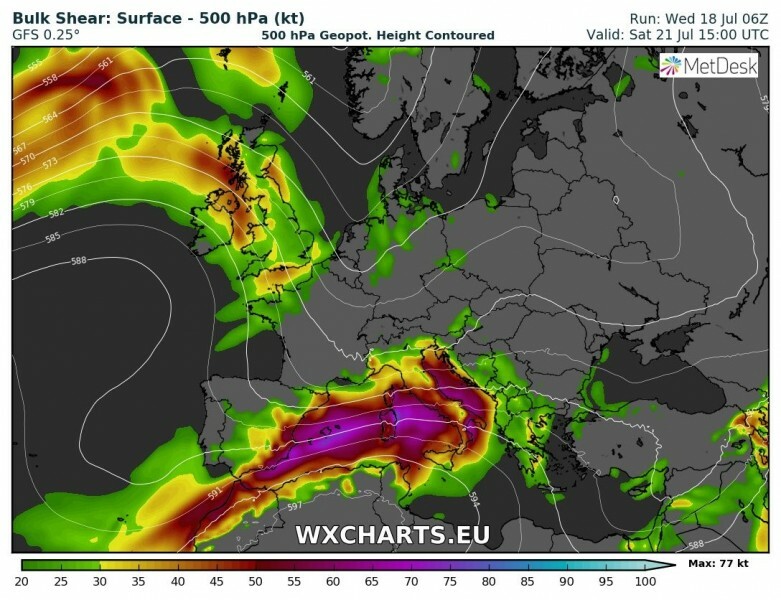 A developing trough over the E Iberian peninsula can be seen as well; it is expected to deepen while it moves east across Iberia towards N Mediterranean later this week. The improved dynamics associated with this trough will support severe weather across N Iberia and SW France today and tomorrow afternoon. As mentioned above, another trough will be pushed from SW into central Europe and N Mediterranean this coming weekend, resulting in increasing potential for organized severe weather as strong shear and moderate to strong instability will overlap together. Furthermore, the situation seems quite similar to the one earlier this week, the track of the trough seems similar. 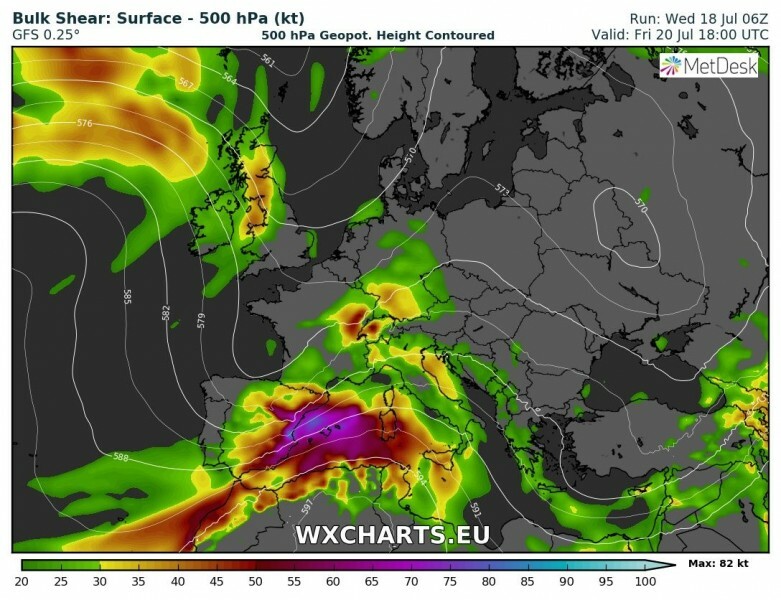 Friday, July 20th – the upper trough is moving across Iberian peninsula, resulting in strong warm advection across the western Mediterranean into France and the Alps, this means instability will build up ahead of the main frontal system. Strong wind field, therefore enhanced wind shear, will support organized storms, including supercells and multicell clusters with large hail, severe winds and excessive rainfall / flash floods threat. The best overlap of the shear and instability seems over NE Spain and S France this day. 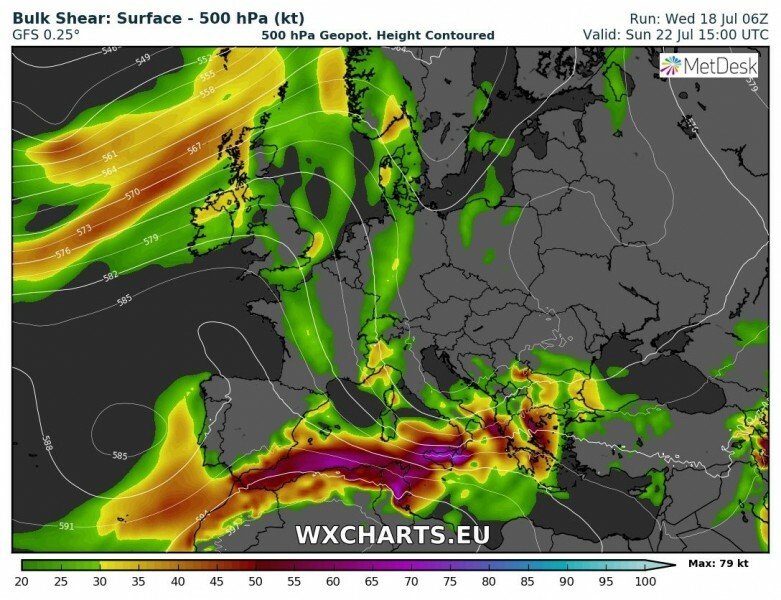 Saturday, July 21st – a trough continues further east towards central Europe where moistening of the boundary layer results in strong instability across the whole N Mediterranean region, combined with strong deep layer shear above. 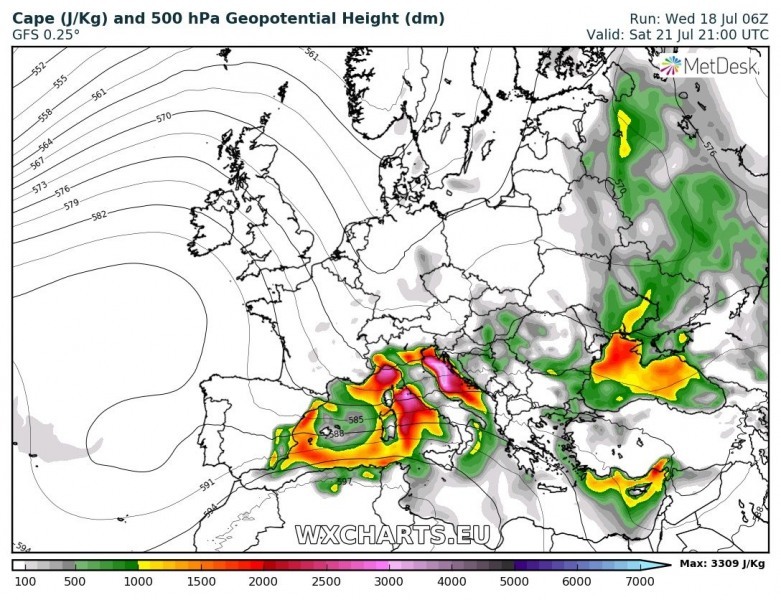 We can expect severe weather around the Alps and N (partly central) Italy, including supercells with very large hail, damaging winds, flash floods and even tornadic storms where greatest low-level shear/helicity will overlap. 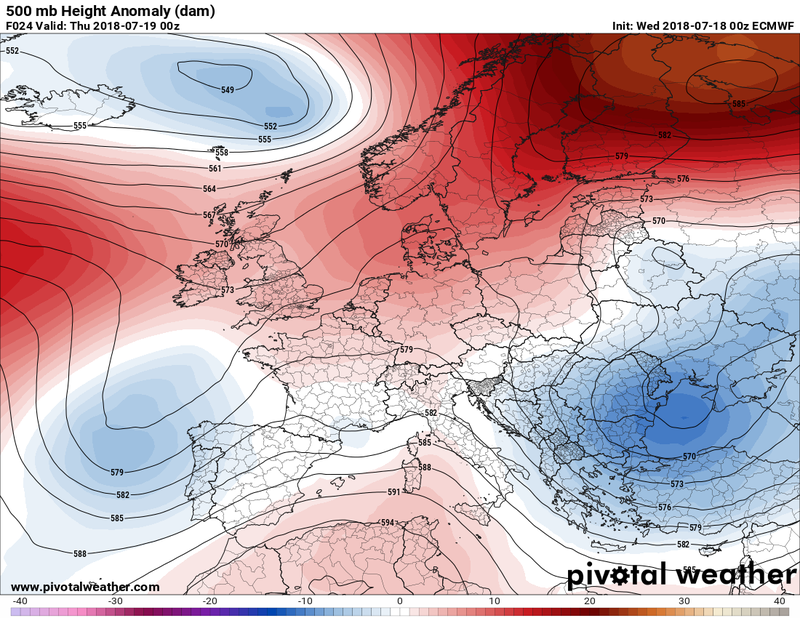 Sunday, July 22nd – at the end of the weekend, the trough pushes towards NW Balkans, so the most unstable airmass will be placed across central Mediterranean and SW Balkans. With still a lot of wind field above, enough shear will exist to be supportive for organized storms as well, similar to Saturday with all types of severe weather possible. 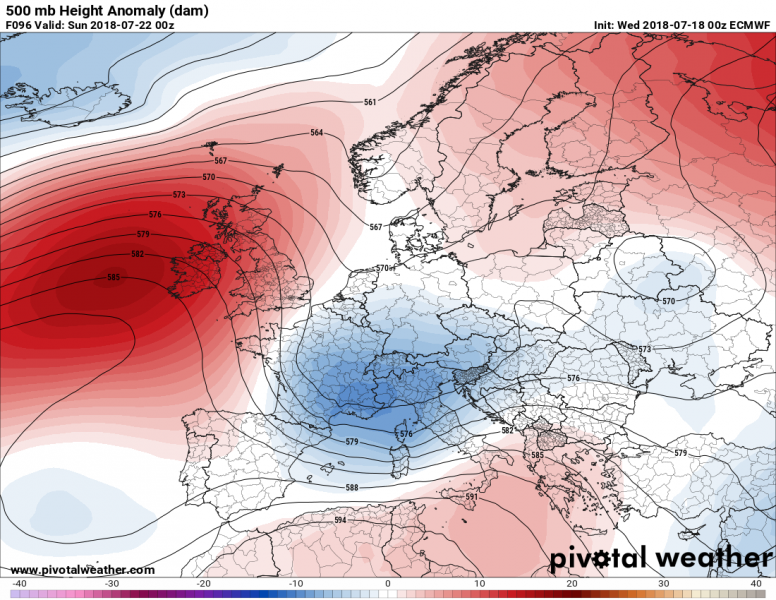 Cooler weather in the wake of the trough will bring more stable conditions across the N Mediterranean and Alpine region. 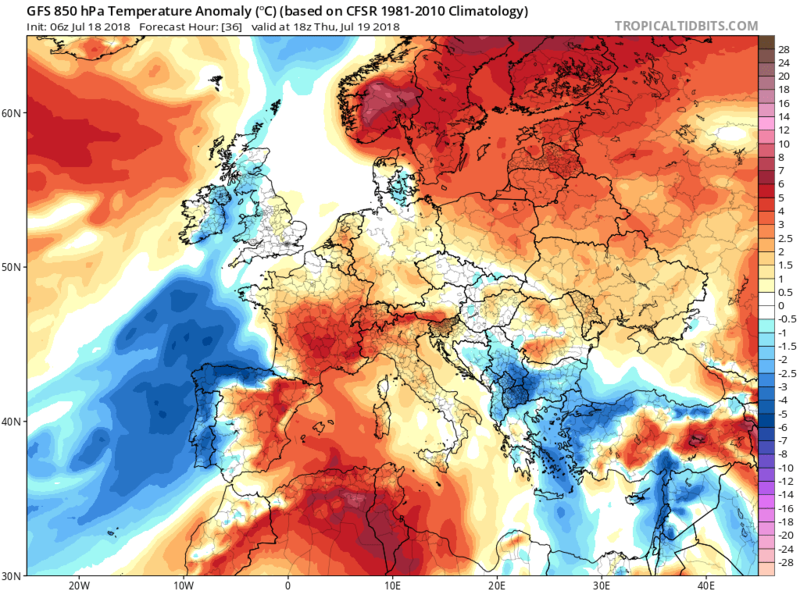 More dynamic weather across central Europe will also lead into cooler temperatures over the region through the weekend, but this should be just temporary as warming up returns early next week. 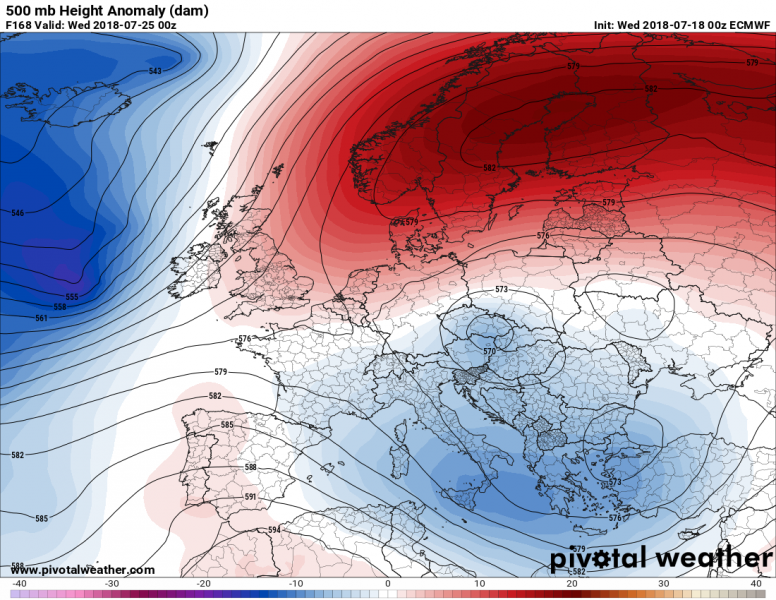 Next week, the pattern supports a yet another strengthening of an upper ridge across N Europe and NW Russia which will lead into more very warm and hot days over the region. It is becoming increasingly likely the new heat wave could be even stronger than the current one. It may likely increase fire threat as well! Stay alert! 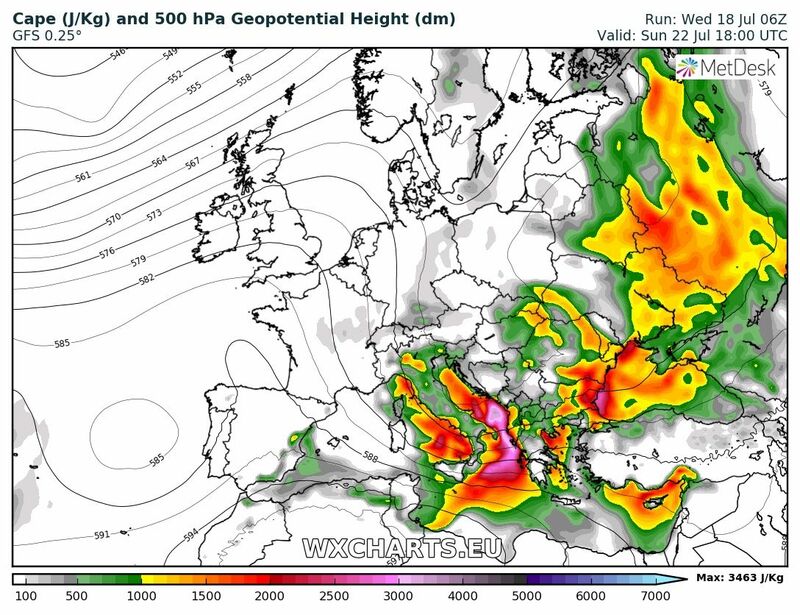 An extensive upper trough / low geopotentials are foreseen across the E Mediteranean, S Balkans and SE Europe, so expect cooler temperatures and daily convective activity. However, weaker wind shear across the region should not support widespread severe weather activity. Stay tuned for further updates on the pattern evolution. 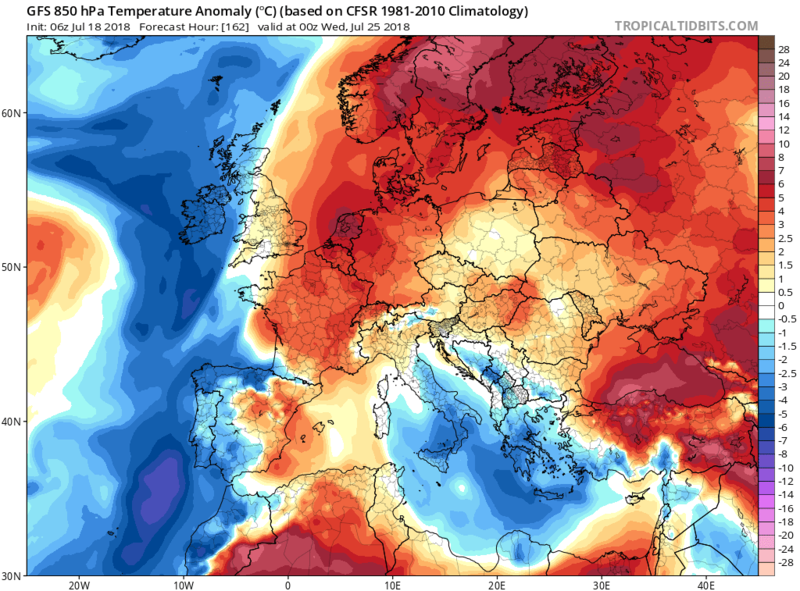 «Next Post Yet another hot day far up in the Arctic circle – northern Finland already at 33 °C by 11:30 UTC (July 18)!